Electicity produced by wind energy, wind turbines, are infact a renewable resource and alternative energy source. The complexity of developing a Wind project is similar to that of a mining project, or hydro dam, the resource needs to be measured. The project’s air flow, optimum placement and location, and data has to be analyzed to ensure economic sense. 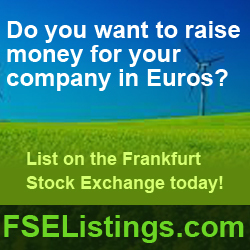 Wind Energy financing is available for firms looking to list on the Frankfurt Stock Exchange. The wind energy finance can be before the feasibility or after, the important part is the competency of the team listing on the Frankfurt Stock Exchange. Wind energy is a very attractive resource, we have worked with Wind Energy companies within South Africa raising over $100,000,000 for a wind farm in the Cape area, as well as, advised on projects within Western Canada, Eastern Canada, and the West coast of the united States for Wind Energy Company financing. Similar to most renewable energy firms, public wind energy firms receive a lot of attention and able to capitalise from getting their story to the market. 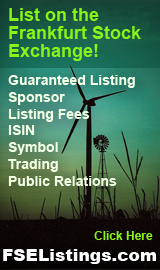 A requirement of listing on the Frankfurt Stock Exchange is having a good presentable wind energy website and presence. Our expert team assists in advising how to prepare the website, video’s, press releases, and documentation to raise capital in the Frankfurt market in a short systemized amount of time. Our proprietary process of dealing with Energy Companies allows for us to apply our expertise on the Frankfurt Stock Exchange with your expertise within the Wind Energy sector and make a success. With the energy crisis, energy stocks are a very popular investment forum, it is simple energy economics, with the rate of energy increases, the value of energy becomes more profitable within the alternative energy sector, the alternative energy resource therefore becomes more profitable. A viable wind energy project can get energy financing, power purchase agreements, and sell their carbon credits, but often to start the turbine turning, a company requires substantial capital which is best found by listing on the Frankfurt Stock Exchange. Energy costs are climbing, energy companies are being given energy grants, special preferential pricing, subsidizing alternative energy production, all positive momentum within the industry. There are many factors such as these that make an alternative energy company such as Wind energy a good public listing on an exchange. Wind projects are heavily supported in Germany, with several turbine manufacturers and wind financing forums, there is no listing as ideal as FSE Listings. Germany has long since been experts in engineering and energy consulting globally, the market recognizes the projects and potential better than any other stock market in the World. The global nature of the Frankfurt Stock Exchange embraces foreign companies to list on the exchange, with over 89% of the listings being from outside of Germany. By listing your wind energy firm on the Frankfurt Stock Exchange, you can take advantage of the 3rd largest market in the world for financing, and it is a market who you do not have to convince, they believe. What better market to sell your alternative energy project than one that believes in your business model and company! Renewable wind energy companies and areas are supported by associations and groups, such as wind energy Uk, wind energy Germany, wind energy Europe, wind energy South Africa, however, the Frankfurt Stock Exchange and the German market are the most active investors within this sector globally. Models on green energy sources still favour wind energy sources as a viable economic alternative energy source, aside from Hydro and Nuclear. Nuclear energy has been hit hard with recent global events and disasters, bring light back to hydro, solar, wind, and unfortunately a currect growth market of coal. Alternative energy sources are being pushed by countries like China more than ever before, which is going to be the engine behind your future IPO on the Frankfurt Stock Exchange as Asian market financiers are heavy investors into the Frankfurt Stock Market. 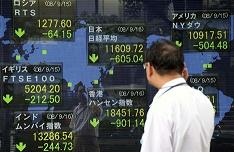 Now is the time to seek wind energy project financing by going public on the Frankfurt Stock Exchange. Investing in green energy is often about where the energy company is listed, Frankfurt is the best forum for attracting this investment. Contact us for more information for your wind energy and alternative energy company. We are your source for Wind Energy finance through the Frankfurt Stock Exchange. If you want to be energy efficient in your efforts to raise capital, you will contact FSE Listings Inc.
A listing takes 2-6 weeks from the date of incorporation, provided all of the companies documents are in order. Contact us for more information on our Frankfurt ready shell company and Frankfurt Listed shells. This entry was posted on Wednesday, April 27th, 2011 at 6:35 am	and is filed under Uncategorized. You can follow any responses to this entry through the RSS 2.0 feed. Both comments and pings are currently closed.